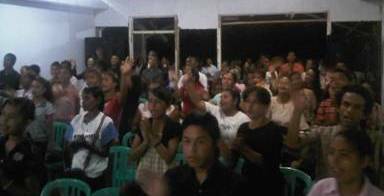 Praise and Divine Healing Service was conducted in Piru, West Seram Regency, Maluku Province, on Sunday, November 13th, 2011 at GPdI Piru. Before the event was started, the souls began attending, some even use 2 trucks, public buses, cars, motorcycles, and on foot. Not only the church doors were released, but also the wooden walls were dismantled for viewing from the outside. The benches were arranged down to the church yard and at that time there were 300 souls present. The Word of God delivered by Rev. Gideon, from Luke 5: 12-16, about Jesus healed a leper and was told that as the Lord Jesus said in the Bible “I will: be thou clean”, so He also wanted to cure the sicknesses of those who were present at that time. 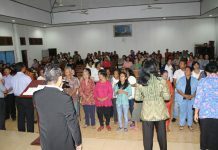 Many were healed by God at the time of KPPI at GPdI Piru and God’s miracles happened, including asthma, uric acid, pain in knee joint, pain in the waist joint, 1-year-old infant who could not upraise his head and could upraise his head, stroke could not raise hands, cramp on feet, they were all healed by God. Thank God! Hallelujah! God is very good for His people!